Ever heard of butter coffee? I’m betting you’ll love it! And here’s how you can make it at home. The first time I heard of butter coffee, I thought it was something like a Shot In The Dark – coffee with a shot of espresso. Then I read the recipe – coffee with coconut oil and butter. Huh? At first this did not sound good. I love coffee, but putting fat into it just sounded vile. Then our chaplain at the college where I run my coffee shop came in one day and asked for it. I was reluctant, but he told me to try it. One taste turned my opinion around in a hurry! Despite the fact that butter coffee is relatively new here in North America, is has been consumed in Tibet and Ethiopia for many years. In countries like Tibet, where is is harder to get butter as we know it, yak butter is often used. Our brains are dependent on fat. This may be why it is thought that consuming coconut oil may help promote brain health and function. Coconut oil may also help maintain a healthy weight, support thyroid function, and promote healthy blood sugar levels. Coconut oil can help boost metabolism and energy. Coconut oil is also antibacterial and anti-fungal. Coconut oil may aid in removing cholesterol from your body as it converts cholesterol to prenenolone which is a hormone that many of your bodies need. And lastly, coconut oil may help the body in absorbing fat-based vitamins such as Vitamin A, which is present in butter. The original recipe for butter coffee contained MCTs, or medium chain triglycerides, most commonly found in palm kernel oil, coconut oil, and butter. MCTs are a good source of energy for the body and have been shown to promote healthy weight and metabolism. Coconut oil is one of the most stable of the fats and oils available as it does not go rancid over time. Or, if it does, it is very slow to rancidify. You can get coconut oil that has virtually no taste or there are some brands that carry a more pronounced coconut scent and flavor. All coconut oil is solid at 76°F, some melting at 77°F and some at 93°F. For this application, either will work. Butter is used in butter coffee to provide creaminess and flavor. Grass-fed butter is the best to work with as it has flavor the other butters can’t compare to. Butter contains high amounts of Vitamin A (86% of the daily requirements in 100 grams), Vitamin D, and Vitamin E. While butter also contains cholesterol, it can be eaten in moderate amounts by most people. Unsalted is most commonly used, but you can used salted as well. Ghee is clarified butter that has been heated enough to turn the milk solids in the butter to brown bits that can be strained out. Ghee still contains the flavor of butter but is shelf stable and can be kept in a cabinet without refrigeration. You can also infuse flavors into ghee, such as cinnamon or nutmeg, which will subtly flavor your coffee. Note: When making butter coffee, be sure that your coffee is very hot – hot enough to melt the fats but not so hot that you burn yourself drinking it. You need to work quickly as the heat can build up in the blender and blow the lid off. Add the coconut oil and butter or ghee. Place the lid on top, making sure it fits tightly. Blend at high speed until foamy. Pour back into the mug and enjoy while hot. This recipe is light and foamy with tons of flavor on its own, but you could add sweetener and cream if you like. If you add cream, be sure it’s warm or that you add it to the blender first. If it is cold, it can harden the butter and coconut oil, creating a hard mess of cold fat. You can also add other flavors like cinnamon or chocolate, again, adding while blending is best. I like using salted butter as it adds a subtle salty taste, much like salt on dark chocolate. And as always, if you are wanting to try any supplement for health benefits, please consult with your health practitioner. Some of these ideas still need more research and are not approved by the FDA. 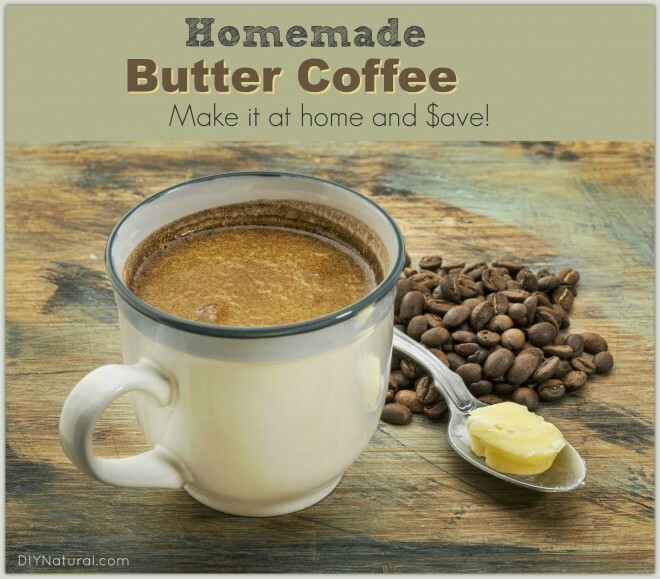 Butter coffee provides a different kind of comfort drink that may benefit your body. Have you tried butter coffee? I have a little hand foaming device for foaming milk that runs on 2, AA batteries, but it works great at making butter coffee. Fast and easy cleanup. I love using Kerry Gold Butter. It has a great taste and I like Dr. Bronner’s Extra Virgin Coconut oil. We have been using a Nespresso machine for years and we recently began adding coconut oil to the frothing machine (aeroccino). Just delicious and we know it’s good for us! Never heard of this, but am a big coffee fan(snob) and wanna-be health nut, so I gave it a try. WOW!!!! It’s amazing!!! I’m hooked! Thanks! I LOVE my butter coffee! I’ve been drinking coffee this way for 2-3 years now and have a a hard time with going back to the old way. When we went camping the first summer, I would just have regular coffee in the morning and it is just not as satisfying. Of course, I am not taking my blender camping! Well, last summer, I decided I could take a Magic Bullet camping. So, as long as we were somewhere with power, I could have the best cup of Butter Coffee in the great outdoors. I put 1 Tbsp butter, 1 Tbsp coconut oil and a squirt of either English Toffee Stevia or Cinnamon Stevia. So yummy! It’s like one of those fancy, foamy Starbucks coffees, except this is good for me! The cream does not need to be warmed first – it will all melt into the hot coffee. I put coconut oil, blackstrap molasses, and gelatin in my coffee every morning & then add cream. As the cream heats up in the coffee, any little bits of coconut oil that might have solidified when coming in contact with the cream melt again. I can’t wait to try this tomorrow morning!! Sounds delicious ? I make my butter coffee with coconut oil, whole milk and blackstrap molasses. I add the molasses for the nutritional benefits and it adds a richness to the coffee. Yum! I love my butter coffee, 2 tablespoons coconut oil, coconut milk and coconut culinary cream. It is so good and is my wakeup coffee and breakfast all in one mug. I heat the coconut milk first, add the coconut oil and let it melt a minute while stirring, then add the coffee and a little stevia, yummy. Another perk is the oil leaves my lips nice and soft. Why couldn’t you just add organic heavy cream to the coffee along with coconut oil since that is what the butter is made from? You could. She’s just saying that it needs to be warmed first; if it is cold it will solidify the coconut oil and you’d be drinking coffee with oil chunks in it.